Damn, Roller…this is some great information! Thanks for the efforts, and great job on the visualizations as well. This is definitely going to help us student ID folk for years to come. Interesting survey! I value executional skills, like illustrator and photoshop skills,as much as the other skills when hiring a junior designer. These skills are related to relatively more time consuming work, and requires less work experience to do it well. 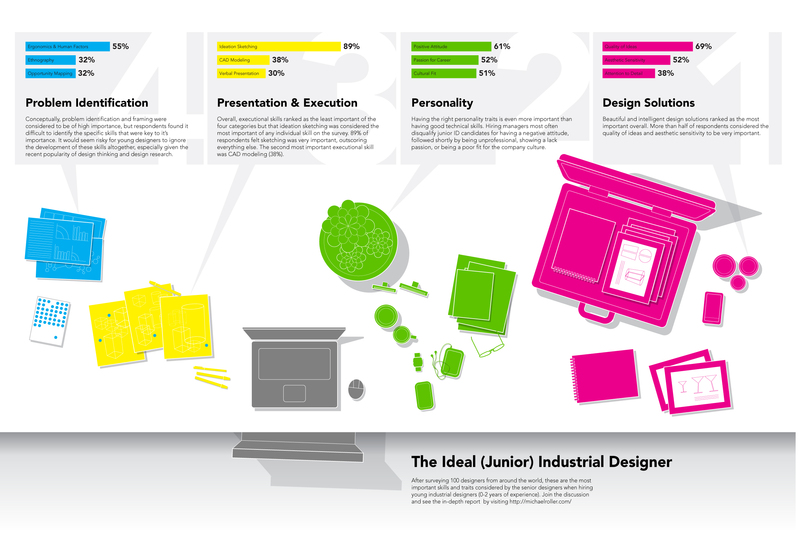 So I am a bit surprised that these skills are found the least important for junior designers. But I agree that all the 4 mentioned skills are the most important. Waikit- I was surprised about the low level of importance given to those skills too. In my consulting experience, I place a lot of value on those because we use those skills to communicate outwardly. Internally, it’s not as important to me if the sketch is great or not, what matters is that our audience understands the idea when we present it. It’s possible that people chose to lump many sketching forms into their “ideation sketching” vote, but I think the term “sketch rendering” is fairly universal so I’m still surprised by that. hmmmm…. most of it is true. I have jumped around through various types of organizations whether it is design firms, research firms, technology, etc. ideation sketching is the core of survival in this economy. if you can’t sketch right there with the client about their problem, then good luck. I disagree about basic computer skills (photoshop). To me this is second after ideation sketching. But currently there is a new problem. Yes quality of ideas is important but creativity is highly important. And i notice you did not use the word “creativity” in your survey. When interviewing potential people (whether they are designers or can sketch); we look for people that can come up with ideas on the spot. the more the best, to allow conversation to flow between people building new ideas. I think one of the important factors not mentioned in the survey is the ability of working in teams. Maybe it is just our middle-european personality, but hungarian students are often incapable of working together and improve their ideas with other people’s advices. They stick to their own method and try to work out everything on their own which i think is a big mistake because we are not artists. we are creative people with good communication skills and sympathy and we have to work with other people every time especially when we are talking about companies. What about science and math skills? I deal with so many “product” and “industrial” designers that are able to spit out pretty computer images and sketches, yet they lack any concept of real world physics, supply costs, and balance loads. I think the iPhone4 might be the epitome of this current trend, and major problem with industrial design. Nice study Mike. did not see any recommendations at the end. Maybe I missed them. What would be also interesting is to see what trends these folks are seeing concerning project scopes, areas of opportunity and new or emerging skills. I feel we in academia can give the employers what they want and for the most part do, but also have a great opportunity to prepare students for whats coming. any thoughts? Great study Mike – Like a lot of people here I am surprised by the low scoring of software skills like Photoshop, but am also really surprised that how low down manufacturing knowledge is – surely all designers need to have a good understanding of this to work in the design industry. What would be really interesting is to conduct the same study with Industrial Design students and then compare their perceptions with what the industry expects. Do most design students really understand what they need to be able to do? Hywel. I would love to do a study on the differences between how important students perceive some of this info compared to professionals. It would be a nice piece of information for educators for sure. We’d have to work around the bias that comes with the release of the current study (especially since it’s been shared on a few popular sites). If anyone has any thoughts, we can get to work on the next study! Nice effort and some good information there especially for fresh designers getting out of school. I think though you might have over split your breakdown into 1 too many clusters. This might have watered down your results. If you look at the results, to me there is no difference between 3.20 and 3.11 or even 3.06 for that matter. I would suggest that you could reclassify into 3 clusters rather than 4.
a) Design Ability (Combine design solutions + framing & problem identification; essentially two sides of the same coin. Also, if you looked back at the results, (3.20, 3.11, 3.06) for that matter. The way I read it is that these 3 clusters are equally important, and should be seen as key individual criteria rather than ranking each on top of each other. Put it this way, the junior designer I would hire would need to have something in these 3 categories, even if a designer was a hot sketcher, if his personality sucked he would be out the door. Very interesting study. Being on the student end of the hiring process, it’s helpful to hear where employers are placing value. I’d definitely be interested in seeing what the student perceptions are, but also those of educators and co-op advisers. These people can have a big influence on students’ perception of industry expectations, and they have the ability to emphasize different aspects of the design process. Also, I wanted to give a heads up that there is a typo on the top of Page 6.
as a fresh design graduate, i find this a very useful post! i would also like to see a survey based on student views. it would be interesting to compare both employer and prospective employee views and see the results! thanks for the very valuable information michael! and thanks to all who have commented on this post, very valuable opinions and feedback! Very useful information Michael, thanks for sharing it. I just finished reading it looking for some fresh advices for my next job hunting, but I must say I couldn’t stop thinking about the institutions where new graduates come from. Is this really irrelevant when deciding who to hire? or even the nationality of the potential candidate? In my personal experience sometimes the “not correct” passport and the possibility of avoiding visas-paper work could step you off a dream workplace. Even with great sketching abilities, passionate for design, ultra charismatic personality, aesthetic sensible, and even with 3 fluent languages and a bachelor / diploma from a renewed University in Europe. I believe sometimes when hiring jr. designers this factors could play important roles as well. Therefore Michael I would like to ask your opinion. What advice could you give to a Latin American Jr. designer with all the characteristics mentioned above + 1.5 yrs of working experience looking for an opportunity to collaborate with a “big name” design consultancy in Europe/US ? How could a Latin American designer could compite vs a US/ European designer ? This is an interesting study, but I think drawing is way overrated. It’s a great way to fill pages with pretty pictures, but if a designer can’t analyze and truly understand the critical elements of a design problem, all the sketching skill in the world won’t save them. On the flip side, I work with a designer that can’t draw to save his life – but who nonetheless can get down to the problem at hand at least as effectively as any sketch monkey. In other words, you can be a very effective designer with no sketching skills. I am personally very good at sketching, but I find myself using the skill less and less in favor of other ideation methods that help me to solve the often more important intangible problems. I do think we are moving towards a world of objects that merely facilitate experiences, rather than objects that are an end in and of themselves. At least that is where I see the money headed, and I’d rather go where the money seems to be headed than not. And I would advise the same for any young designer with a head on their shoulders. Don’t waste your time being a great stylist. Find a path into product strategy. As an ID student and the head of my school’s IDSA chapter I find this information to be very interesting and helpful. Thank you for taking the time to do this study! I hope this can help reinforce the importance of sketching within a curriculum. Currently our program values model making above all else – our desks are so destroyed that we can’t even sketch on them. Hopefully this information can help us in our quest for an updated curriculum and a more productively designed studio space. Thank you so much!!!! !